Building a shed requires a lot of patience and attention to detail. There is no need to call in professionals, but in order to build a good shed you should follow these expert tips. To begin, you must first draw out a plan of where you want the shed to go and how you want it to be built. Lack of planning can lead to unforeseen problems. These problems can add time, expense, and cause the quality of the shed you are building to suffer. So maintain a relatively straightforward project, and plan accordingly. When building your shed you must start with a solid foundation. The secret to building a shed that will stand the test of time is to build a strong base. Most sheds can be supported by an on-grade foundation. This foundation consists of solid concrete blocks or pressure-treated wood timbers also known as skids that set directly on the ground. Be sure that the foundation is leveled and appropriately sized to properly support the floor frame of the shed. When using concrete blocks, note that it is important these blocks are solid and not hollow. 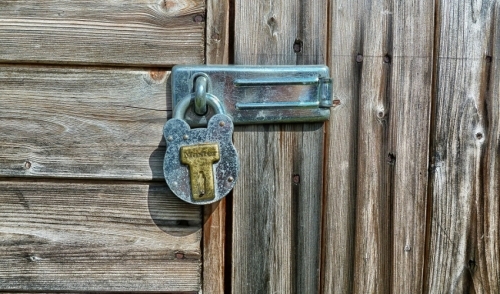 Hollow blocks can crack easily damaging the integrity of your shed. The next secret to shed building is to allow space for air circulation. When building your shed be sure that the mudsill, the lowest wood member, is at least six inches above the ground. This will keep excessive moisture from rotting, warping, and corroding the structure of your shed. This requires that you build a weather resistant floor frame. There are several ways to cut costs when building a shed, but this should not be one of them. Do not be afraid to spend some money when it comes to the building materials used for the floor frame. Always use pressure treated lumber when constructing things that will need to stand up to the elements. As for the sheds' floor deck, use Â¾-in. or Â½-in exterior-grade plywood. Anything thinner will loosen between joints. If you are using your shed to store heavy items such as a lawn tractor or other heavy machinery, use Â¾-in. tongue-and-groove plywood. This can cost a bit more, but it will give your shed a rock solid, rigid floor that will last. Another secret to building a shed is getting smart about door size and placement. This can require some thought depending on what you plan on storing in your shed. There is no sense in building a shed to store an item that cannot fit through the door! There are two common types of doors, hinged and sliding. A hinged door takes up less space and closes more tightly. However, sliding doors are easier to install and glide completely out of the way. Whatever your choice is, make sure it is the right one for you. Finally, when building your shed use low-maintenance materials. This will save you time and money in the long run. There you have it, the secrets to building your very own shed!